I’m writing this in Kathmandu, Nepal, at the end of the Global Tiger Workshop , the latest event leading up to the Tiger Summit expected to be held late next year in Vladivostok. This process all began with the major launch  of the Global Tiger Initiative  (GTI) in Washington, DC, in June 2008, and direct engagement with the tiger range countries on the issue of illegal wildlife trade really took off in Pattaya , Thailand, in April this year with ASEAN-WEN  and other partners. This was no ordinary World Bank-facilitated meeting inasmuch as National Geographic filmed the event, and it included a kilometer-long, elephant-led parade of children calling for the conservation of tigers. The GTI team keyed into the Asian and global media through op-eds, press releases, and YouTube. It also had significant support from the highest levels of the Nepali government which excelled itself not just in organizational support and hospitality, but also in commitments for tiger conservation – i.e. 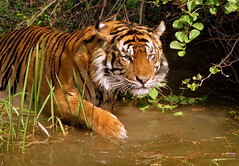 plans to double the size of one of its top tiger habitats, Bardia National Park. As remarked by Eric Dinerstein , World Wildlife Fund-US Chief Scientist, there has not been such a positive period for the future of Nepal’s tigers in all the 35 years he has been living in and visiting Nepal. I’m not really a meetings person. Conferences are large and typically held in rooms with no natural light or views and if one is jetlagged (as I am much of the time), the lack of visual clues as to the time of day can be devastating to sleep patterns. This makes the general tiredness even worse which manifests itself in those fruitless attempts to sleep with one eye open while yet looking serious and engaged. Also, when the talk being given is not exactly inspiring I find my mind racing and reminding me of the countless emails I really should be writing to colleagues, the project proposals I should be formulating, or the invoices I should be approving. As I wrote in an earlier blog , there is a great deal of passion surrounding the subject of tiger conservation, and for the most part there has been a great deal of energy surrounding the thematic and country-level sessions and small-group meetings in this workshop. There are official delegations from each of 13 tiger range countries (TRCs) together with national and international NGOs, and the intense desire to actually save the tiger from extinction in their natural habitats was palpable. Prime Minister of Nepal, together with the Minister of Forests and heads of delegations from Thailand and Russia preside over the Global Tiger Workshop’s Inaugural Session. While this desire held all of us together, finding a way of expressing that, taking into account all the different national priorities, situations and cultures, was difficult. Indeed, the nadir of many large international meetings is the discussion of the joint Statement, or Declaration, or Recommendation. In Kathmandu, a drafting team led by Jeff McNeely, recently retired as Chief Scientist of IUCN, put together a draft and this was then subjected to several hours of committee editing by the assembled delegates of the tiger range countries with occasional inputs from others. Jeff’s patience was tested as delegates requested commas removed here and ‘sustainable’ inserted there, and as some argued for politically-correct text over more ‘edgy’ alternatives, and vice versa. A succession of beleaguered on-screen editors tried to keep track of and make the changes. Perhaps the most interesting interventions were from the Chinese delegation, which asked that 2010 not be referred to in the draft as the "Year of the Tiger," since this was cultural property of China and it would be demeaning for it to be used as a means of arguing for conservation actions. Vietnamese and other delegates felt, however, that the eastern astrological calendar was not the property of any one nation and the opportunities presented by the Year of the Tiger were explicitly retained in the final version  (pdf). Also notable was India’s insistence that it already had virtually everything under control and didn’t really need any outside help. Every good meeting ends with a motivational exhortation for those present to go forth and deliver on all the promises and good ideas. We got two. One was from Hon. Deepak Bohra, Nepal’s Minister of Forests and Soil Conservation, who spoke with strength and knowledge about the issues. The other was from Keshav Varma, the head of the Global Tiger Initiative at the World Bank. His passion and vision have been the drivers for the Initiative and he has managed to garner tremendous support and an expectation of change. But tiger populations are still highly insecure and it is clear that so much more needs to be done by the range states themselves and by donors. The GTI is on the task. As the meeting closes, people are taking the short flights on Buddha Airways to fly along the Himalayas towards Mt Everest, or leaving for a few days in Chitwan National Park  to see wild tigers and the rhinos. I am torn and would love to do likewise, but I am off to the next remarkable meeting, this time in the UK, and that is surely going to be worthy of another posting.